As some of you may have gleaned from Instagram (I'm Sal_Strawbs over there!) 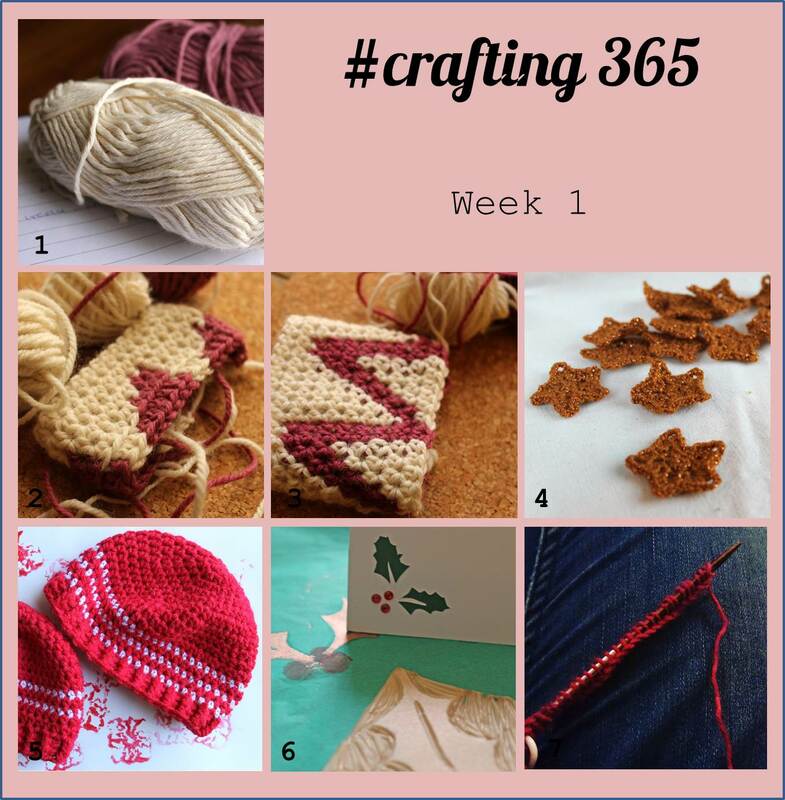 I am taking part in a #crafting365 challenge initiated by Vicki Brown. You can read Vicki's words about it here. Yep, 365 days of craft......pretty easy really, as I do craft most days (however small), though the photography, and posting a photo a day is a bit of a challenge to me. I'm still using my 'big camera' as I'm frankly embarrassed at the quality of the photos from my phone camera. This, coupled with an incredibly slow laptop has thoroughly tested my patience! However I am pleased to say I have completed my first week! 5. Some Christmas hats I have crocheted up for colleagues at work to give as gifts. 6. I spent a fantastic morning at Kirstie's Handmade Christmas Fair in Manchester at the weekend. I tried my hand at paper cutting and lino printing. I was a bit naughty and have treated myself to some lino cutting tools so expect to see some poorly executed prints over the next few weeks! I also bumped into Vicki Brown herself in the toilet queue! 7. Checking that I can still knit.......This is the 'Sockhead hat' by Kelly McClure and the yarn in Lanagrassa in India. Fourth time lucky on this cast on!